Andalucia’s Arco Iris (‘Rainbow’) federation of LGBT organisations has filed a legal complaint with the office of Spain’s Fiscalia General (‘attorney general’) calling for investigation of a far-right organization on the grounds of potential hate crimes for its distribution of 100,000 copies of an anti-LGBT leaflet in nearly two-thirds of Spain’s 27,812 schools nationwide. The 41-page leaflet, directed at parents and entitled ‘Do you know what they want to teach your child at school? The laws of sexual indoctrination’ (¿Sabes lo que quieren enseñarle a tu hijo en el colegio? 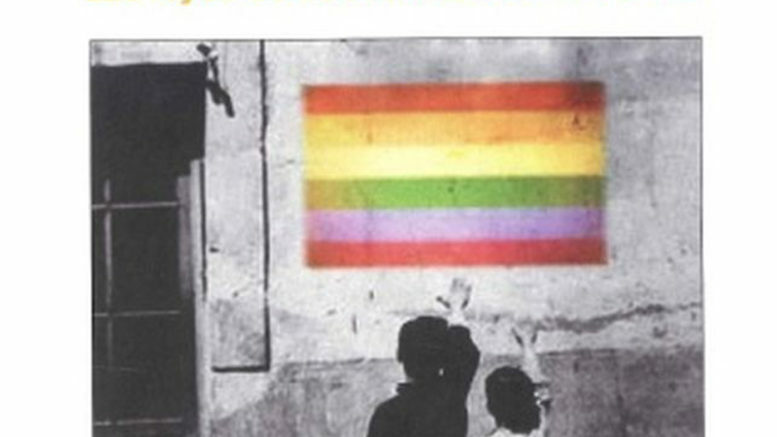 Las leyes de adoctrinamiento sexual), feature a cover picture of two children offering a fascist salute to an LGBT rainbow flag painted on a wall. The leaflet directly criticizes the growing number of anti-discrimination and anti-homophobia legislation passed in recent months in a number of autonomous Spanish regions, including Madrid, Catalonia, Extremadura, Murcia, the Balearic Islands, Navarre, the Basque Country, Galicia, Andalucia and the Canary Islands. On Nov. 22nd, the ultra-right group Hazte Oir began a campaign to distribute the leaflets to parents at 16,500 schools nationwide, many of them Catholic church schools receiving federal government subsidies. A well-known ultra-right group in Spain with ties to international right-wing Catholic organisations, Hazte Oir has been singled out as organizer of right-wing protests that helped topple former Socialist prime minister José Luis Rodríguez Zapatero and has also been active in organizing campaigns against Spain’s anti-austerity party Podemos.